The Hôtel and Geos Spa Sacacomie, located in the forest of Saint-Alexis-des-Monts, Québec, is the first Canadian project to receive Forest Stewardship Council (FSC) Project Certification (FSC–P001563). 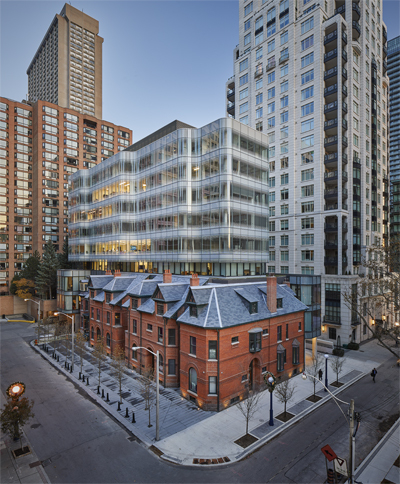 Coated low-iron glass ensures standard bent glazing meets all the requirements for a convex and a concave bend on the insulating glass units (IGUs) on a Toronto tower. The unique structure is built on top of six historical Victorian townhomes, which were originally on the building site. The building design called for curved insulating glass units (IGUs) installed in convex and concave elevations as well as flat glass IGUs. The IGUs incorporate high-performance, low-emissivity (low-e) coating on tempered and/or heat-strengthened glass. The glass has white frit lines in a gradient fade. Hariri Pontarini intended for the renovated historical structures anchoring the site to stand in sharp contrast to the glass curtain wall rising above. The architect specified a low-iron bent glass with solar control coating to meet the project’s energy performance criteria, provide clear views for occupants, and ensure the white frit pattern gives the undulating glass a contemporary edge. The low-iron substrate eliminates the green tint seen with standard float glass. This means occupants have clear views, and the frit stands out with maximum clarity. The coated glass brings value to the nine-storey building by offering high visible light transmission while regulating solar heat gain without obstructing the view. This helps the HVAC system manage energy output. The project is targeting Leadership in Energy and Environmental Design (LEED) Gold certification.